Arsenal and Nigeria's Alex Iwobi, 22, hopes that the young Super Eagles squad can learn from its 2018 World Cup and build for the future. Nigeria finished third in Group D after defeats by Croatia and Argentina either side of a 2-0 win over Iceland. Next up for Nigeria is a 2019 Africa Cup of Nations qualifier against Seychelles in September. "The squad is young and we picked important lessons that will hopefully help us going forward," he said. "Attention will soon shift to the Nations Cup and we must make our World Cup lessons count." The Super Eagles, who have not qualified for the Nations Cup since winning the title in 2013, began their 2019 campaign with a disappointing 2-0 loss to visiting South Africa in June. The victory over Iceland had kept Nigeria in contention but their campaign ended just four minutes from the end of their final match against Argentina, only for Marcos Rojo's late strike to knock them out. "We had a lot of hopes and believe that we could do well. We are very proud of ourselves and are going to take the positives of course," the Arsenal forward told BBC Sport. "We are just unfortunate about the last minute goal that came against Argentina led to a defeat that knocked us out of the group. We are taking positives but we are very happy with what we did. 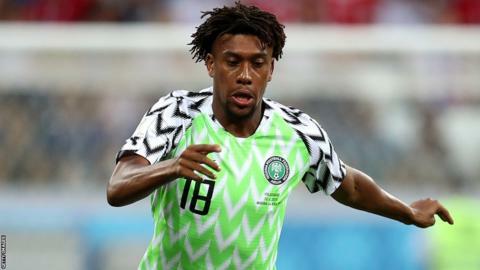 The Nigerian fans had hoped that Iwobi would play a key role in Russia but were left disappointed that the Arsenal player was only given a half against Croatia and late substitute appearances against Iceland and Argentina. "It's not just me or my tournament, it's Nigeria's tournament," he added. "The coach didn't put me in that position because he wanted to try something new, try something else, so I had no problems because at the end of the day it is what the manager decides is what goes." Despite winning just 22 caps, Iwobi is one of the more experienced figures in a Nigeria squad that was the youngest of all the teams in Russia, with an average of 25. Iwobi represented England at under-16, 17 and 18 level before switching allegiance to Nigeria to follow in the footsteps of his uncle and former Super Eagles captain Austin Jay-Jay Okocha. In October 2015 he made his debut against DR Congo in a friendly in Vise, Belgium and has scored five goals including in the 2-1 friendly defeat by England at Wembley last month.